At Nucci Medical, we are dedicated to offering our injured patients ease and convenience in healthcare. 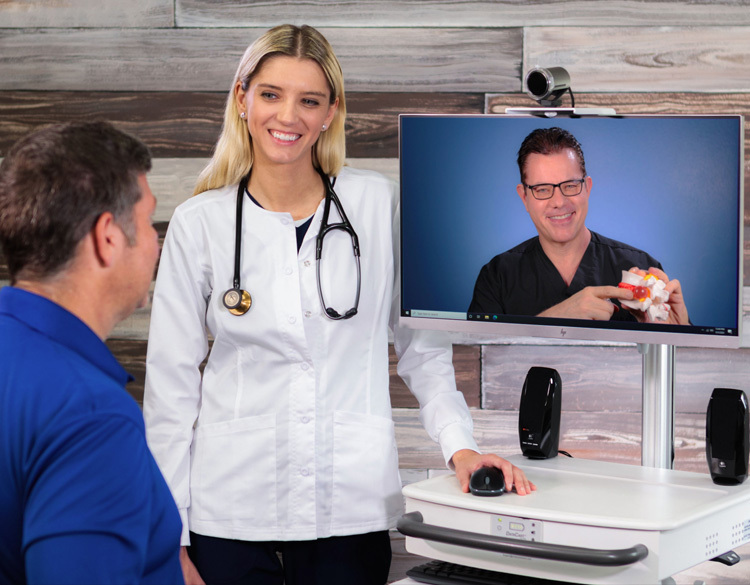 We offer Telemedicine appointments anywhere in the state of Florida to help patients who seek care but do not have a car or other method of transportation or who are too injured to visit the clinic for their first appointment. Our doctors can review your medical records, x-rays, and MRIs via a HIPAA secure portal, while speaking with you over a video system. Our doctors will review your medical history and perform a focused physical exam then provide a working diagnosis and treatment plan for your next office visit. Our doctors will be able to answer any questions you have through your Telemedicine visit, from the comfort of your own home. Will I be receiving the same level of care online as I would in the office? Yes, although you are not physically in our office, you will still receive the same personal attention with a complete history, review of medical records, diagnostic tests, and physical exam. Further diagnostic tests and other orders can be done through Telemedicine, if needed. A strong doctor patient relationship is key to good medical care. This is also true with Telemedicine. At a Nucci Medical Televisit, you will be talking one on one with our doctors every time to answer all your questions and address your concerns. Will my insurance cover televisits? Most insurance companies accept Televisits as valid visits, however some workers’ compensation insurances may not. Do I need complicated equipment to be able to have a Televisit? All that is needed to have a successful Televisit is good internet connection, a private setting, desktop computer or phone with access to a microphone and camera. How to schedule a Televisit...What happens next? The patient or workers’ compensation case manager/adjuster calls Nucci Medical to set up an appointment, giving a valid patient email address, as well as demographics. An email is sent to the patient containing the Portal link, Username and Password. The patient also receives a “New Patient Packet” via email for electronic signature. The patient reviews, completes, signs and returns paperwork to Nucci Medical where a staff member will verify completion. Nucci Medical contacts the patient to retrieve information such as MRI reports, x-rays, and MRI films.CD. Once all pertinent information has been gathered, the patient is ready for their Televisit. On the day of the appointment, the patient logs into the portal using their credentials 15 to 20 minutes prior to their scheduled appointment. The doctor will then join the Televisit. Upon completion, the patient will be given recommendations for further medical treatment and a report of the visit will be generated detailing the doctor’s findings.